Unlike other blogging networks, world.edu has been developed specifically to promote education, sustainability, the sciences and social change. You will get your own world.edu address (a sub domain such as yourname.world.edu, start with 3 gigabytes of file storage (that’s about 2,500 pictures!) and all the other great features listed here. You can blog as much as you want. Your blog can be public to the world or private for just your friends, we also offer premium features that are completely optional. We individually screen every blog application to ensure only appropriate content is published on the network, so you can rest assured your blog will be in good company… we want to be recognised as a quality, safe and academic environment. Every day our team of editors considers the best posts from across the network and if appropriate features them on our homepage. Detailed reports on your website visitors: the search engines and keywords they used, the language they speak, your popular pages… and so much more. Paid features, control of advertising and extra storage are all available at the click of a button. Once you sign up for your blog you can access these features at anytime from within your dashboard. Create professional content with a feature set including a spell, style & grammar checker and math formulas and graphics using LaTeX & TikZ. We will be rolling out new features every month. Watch this space! Our blogs come with tools to allow users to easily share your content across the web. All blogs come with Google, Facebook and Twitter commenting built in. You can also add “widgets” to your sidebar to display information from your own social media accounts. Our “Post formats” feature makes it effortless to share anything you find or create. Post text, photos, quotes, links, dialogues, audio, video, slideshows, and more. Progress from novice to power user in no time with integrated video tutorials included with every blog! Create private posts or entire private blogs. Our blogs are powered by the biggest and best blogging software on the web - WordPress. 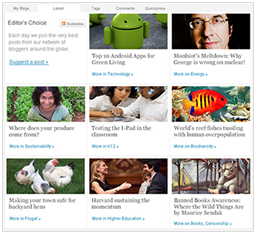 You can choose from over 70 different languages when you sign up for a blog with world.edu. If you have questions about using or extending your blog, we’ve got some of the most responsive support around.